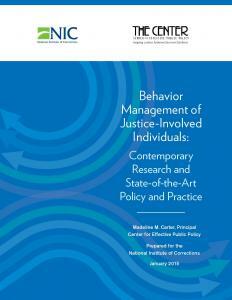 NIC offers technical assistance to help jails assess and improve their management of inmate behavior. This may include assistance related to implementation of a formal inmate behavior management plan or may include assistance related to any one of the six components of an inmate behavior management plan such as inmate classification or supervision. NIC offers training for trainers in the area of interpersonal communications to agencies that are interested in hosting a class that includes participant teams from other agencies. 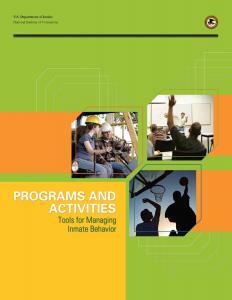 The curriculum provides agency trainers with information and tools to teach their staff about the importance of communicating with inmates, thus allowing them to avoid unnecessary conflicts. Jurisdictions planning, opening, or operating direct supervision jails may request assistance via a site visit for up to three people to see up to two direct supervision jails in operation. This technical assistance is intended to allow agencies to develop new operational ideas for their new or existing direct supervision jails. It is a requirement that jurisdictions requesting this assistance tour direct supervision jails within a day’s driving distance of their location (if any are available) before requesting this assistance. Staff going on the site visit must be in a position to provide policy direction or decisions. Hot Topic: Do you have information on the award of good time or earned time credits in prisons? Hot Topic: Do you have lesson plans on verbal de-escalation techniques? Hot Topic: Do you have examples of operational procedures for segregation units?